In mid-June, we started work with WTI—a flatbed trucking company in Tuscaloosa that needed an overhaul of its driver-recruitment branding and advertising program. To see a typical “pre-Hare” WTI ad, Click Here. As always, we conducted a lot of background interviews—with everyone from recently-hired drivers to longtime CEO Rendy Taylor. From those interviews, we identified four core company characteristics—which then led to their core promise: WTI is committed to everyone’s success: Its drivers. Its office employees. Its executives. And its customers. From that core promise, we developed a number of clever, significant-sounding brandlines that we liked, but didn’t sound so good to Mr. Taylor. Why? They sounded too good. They lacked heart. So we went back to the drawing board, and aimed straight for the heart. Bullseye. (Click on the image below if you need it enlarged). Flatbed trucking attracts a special breed. It requires a lot of effort, and skill, that’s not required in most van-truck driving—mainly the effort and skill it takes to properly secure flatbed loads. WTI upholds very high hiring standards. The company also offers the flatbed industry’s top pay. And they didn’t mind communicating those two points in a competitive fashion. All of which led to the first ad: Click Here. WTI maintains an extremely successful Lease Purchase program—through which, Company Drivers can get the financing and support they need to buy their own trucks, and become Owner Operators. 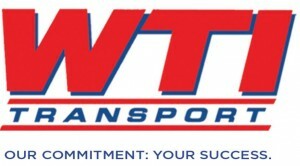 The main reason WTI’s program is so successful is because the company is genuinely committed to their drivers’ success—whereas a lot of companies operate their Lease Purchase programs strictly as profit centers (which is why success rates as low as 2% to 5% for drivers actually taking ownership of trucks are not uncommon in the industry; no kidding). All of which led to the second ad: Click Here. THE RESULTS ARE IN: HOME RUN! Our first day as WTI’s agency (June 8), they gave us an extremely ambitious goal: To increase their fleet nearly 20% (from 292 to 350 drivers) by September 1. By August 17, more than two weeks ahead of schedule, they’d reached 361. Needless to say, the fine folks at WTI are thrilled. And we couldn’t be happier, or prouder, to be working with them. ← Board Out Of His Mind? Not Even For A Minute.